Vaishali, my beloved Vaishali, I still can’t believe that she is not living in this world. But I can surely say that wherever, she is, she must have made her presence felt with her all round personality. 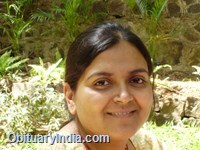 Vaishali, born in an orthodox yet modern, educated, middle class family in Kolhapur. 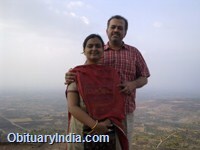 Her upbringing helped her to understand the meaning of living a fulfilled life. She was able to adjust to the situations, was never demanding expensive gifts, and was living a simple yet respectful, happy life. She earned respect due to the good qualities within her. She blended her talent, inheritance with her hard work to earn a Diploma in Civil Engineering and thereafter BE (Civil) degree with flying colours. Her parents wanted her to marry immediately after her graduation and she obeyed them and we tied the knot with me in June 1996, at mere 22 years of her age. We were blessed with our lovely daughter, Shriya, on 31.05.1997. Vaishali wanted to stay away from professional career for at least 5 years of our daughter’s age, to enable her to devote quality time for Shriya. She was engrossed in making Shriya a knowledgeable, educated, learned, lovable and strong person with right attitude. Hence, Vaishali tried her best to do this by constantly teaching, caring & loving, ensuring Shriya’s good health and right upbringing, while compromising on her ‘would be’ career. 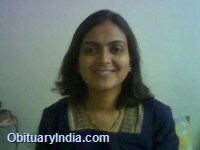 Vaishali did start working in the year 2002, but was always looking for a part time career while wanting to devote her time for our family. But she used to achieve so much during her part time career that was difficult to achieve for some of her colleagues even after working for over time, and her colleagues themselves and her superiors too, used to complement Vaishali for the same. So much was her achievement, that she was asked to give a talk on ‘time management’ and she did a wonderful job of this opportunity too. 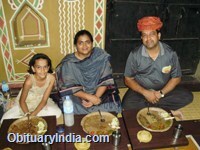 Vaishali was good at time management even at home, as she used to prepare the square meal all by herself for the entire family even for festivities before leaving for office. She was a very good cook; everything was so perfect and full of nutrition, taste, love & affection. She was very good in singing (gave some stage performance too), arts & crafts (rangoli, pots, drawing, cooking, colouring, dance etc which is inheritated to Shriya, too). I can’t stop mentioning here that Vaishali was gifted with intutional power which helped her to make best choice whenever she was needed to. She, unfortunately for her & for us too, had started facing health problems in June 1996 and simultaneously her office too shifted to an away place which was difficult to commute for her. So she left the job, and underwent a long, painful – both emotionally and physically, treatment with lot of uncertainty hovering around about her survival. 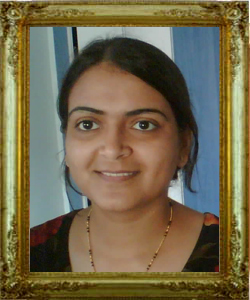 But not only she faced all these with a lot of courage, she even re joined her office in November 1997 (again only for part time) and she did give her best to the job, this time, to a new and unknown subject of software testing and did really an excellent job out of it. She started achieving normancy at home too, with preparing our favorite dishes for us, looking after Shriya’s studies, joining us for family picnics and movies and so on. She started enjoying her extra curricular activities as much as ever. But destiny had something else in mind. 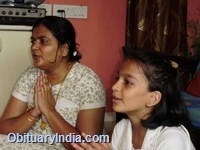 Vaishali left the job for our summer holidays in April – May in 2010 (as she used to do often for giving time to family) but simultaneously her health also started deteriorated. 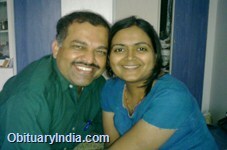 She faced increasing health problems and was staring at an operation during end May 2010. Courageously, she walked to the operation theatre without any support, but never returned back to us. She died in hospital ICU while recovering from the surgery. Ironically, on 31st May 2010, on our daughter’s birthday, we thought of bringing our daughter to hospital, to celebrate the birthday with Vaishali. But as Vaishali never recovered after operation, but she held herself till 1st June 2010 and died peacefully with a lot of twisters and questions in our minds. I still can’t believe that she is no more. It is extremely hard to believe this. I was really unlucky to loose such a gem of a person so early in both of our lives. I still feel that she will come from office, market and so on.